Sometimes you just need a little extra cash to make ends meet. 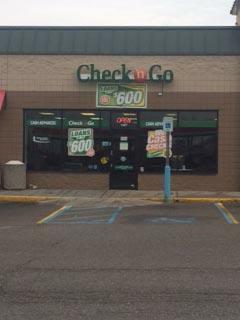 * At Check `n Go Port Huron, we understand and are here to help. Check `n Go can help you get the funds you need until your next paycheck. We offer a wide range of financial options, including payday loans, cash advances and check cashing. Our payday loans range from $50 to $600 in MI. Check `n Go is easy to find, too. We are located on 24th Street next to Sprint. To apply for a Check `n Go payday loan, you’ll need a valid ID, proof of income, an active checking account and a working phone number. Apply online or in-store – whichever works best for you! Either way, the process is quick and easy and you could have the money you need to keep going. We are proud to serve the Skippers community!